Been waiting a while for the opportunity to review this utterly spectacular release. Yes, I know it's been out for some time, but it's terrific and under appreciated. Opening with Twisted Blues, Noy is joined by a who's crew of unbelievable musicians. 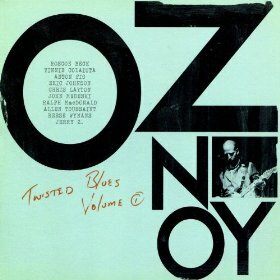 Oz plays a tele on this first outrageous funky track and is joined by Jeff Beck pal Vinnie Colaluta on drums, Will Lee on Bass, Jerry Z on Organ and John Medeski on organ. This is such a great groove and features spectacular bass, drums and guitar work difficult to describe. On Oh Really, Noy and gang is joined by Alan Toussaint for a little twist of New Orleans. Maintaining incredible musicianship, the band takes you on an incredible trip through the quarter like you've never seen. Noy is relentless on guitar and Colaluta punctuates the day like only he can. Touyssaint plays a really nice classic piano solo snugged up to these musical madmen. Unbelievable! You Are The State has a different line up and a different feel. Featuring Noy on a strat, Anton Fig on drums, Roscoe Beck on bass, Reese Wynans on organ and Eric Johnson on guitar, this track has a ballad feel to it and of course without saying... all instrumental. With warm concentric lead guitar runs at the bottom of the fretboard, Noy takes the listener on a brilliant journey. Whole Tone Blues is written around a SRV lope and coincidentally is backed by Chris Layton on drums. This is a swinging track but not at all complying to any kind of borrowing but sticking to his own style...and with style like this...why not? Wynans steps up with a pretty serious organ solo on this track and the release is really well balanced instrumentally, but it's Noy who is running this carnival! On the classic Sissy Strut, Noy gives us a whole new look at how it's to be heard. Using guitar loops and his tele, Noy creates a sonic wall before the jam. Joined by Fig on drums, Lee on bass, Medeski on organ and Talph MacDonald on tamburin. I do want to comment that most everyone who covers this track on thier own release finds this to be the best track on the release. This is a really good cut, but Noy hits the ball so far on every track that this is pale by comparison to the best. Ripping solid blues guitar riffs and with solid back drumming, this track moves. Light Blue, a Thelonius Monk track, is treated with honest respect and the guitar wizardry is just perfect. Noy creates super effects with reverb and clean tones mixed. Wyans on organ has just the right touch and a pristine melody played by Noy is beautiful. Steroids is a funky R&B style track with a bit of James brown mixed in. An eccentric guitar break in the track keeps it from being an outright dance track... but it is artistic and well done. Colaluta takes some really nice explosive breaks on this track showing why he is such high demand as drummer for the best of the best. Two Centers is a solemn study on musical theme. Noy has such a great sense of musicianship and technique that this track, laid back and easy creates a super punch. The release is completed with Trinkle Tinkle with Noy on Strat, Layton on drums and Beck on Bass. A moving jazz like piece with a cool walking bass line and chasing drums, it is a super soaker to keep you foot tapping and you head bobbin waiting for the next release. In case you haven't already figured it out, I think that this release is terrific! If you haven't already heard it, bought it, seen the band and gone nuts... don't say I didn't warn you! !